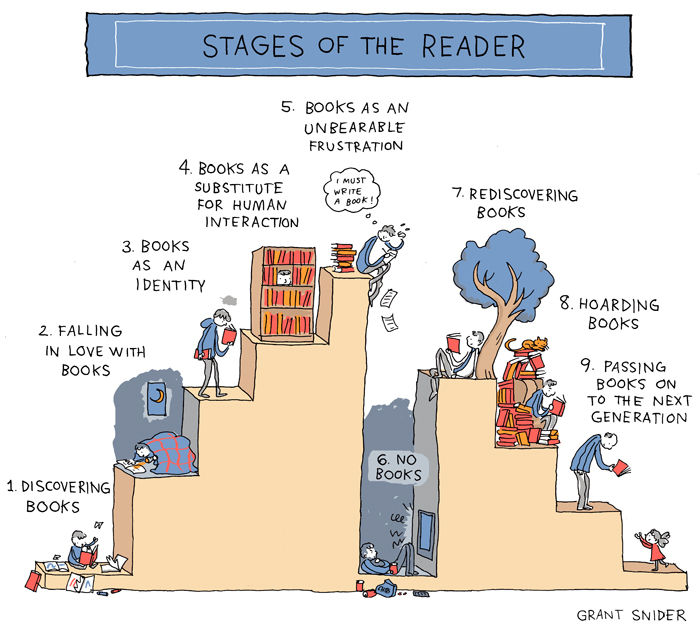 Have you been through these stages? The cartoonist omitted a stage (which I recently experienced) of having to give away hundreds of books due to downsizing. But there are a lot of worthy places to donate your books, sometimes including your local library. And leave a little memento inside, maybe an In My Book bookmark? Are greeting cards headed for extinction? I hope not. What's a more delightful surprise than getting a card in the mail when you least expect it? (apart from a Ferari in your driveway and a few other things...) Don't let one of the more delightful aspects of communication fall into oblivion. Are you a big reader? Then Amazon's new brick & mortar store in NYC is -not- for you. The New Yorker comments "Amazon's new bookstore at Columbus Circle has a bewilderingly small selection, and in some sections seems organized like an ill-advised dinner party." Support your local independent booksellers where you can usually find new authors and great books that are not necessarily bestsellers. It's SPRING, finally!! Grass is growing, trees are leafing and we are welcoming spring babies into the fold. Here's a card for new parents from the wonderful children's illustrator Joyce Wan. I love the simplicity and innocence of her drawings. You can find these cards and a slew of fantastic baby books (babies need books) at her website WANART. Happy spring everyone & don't forget about Mom. 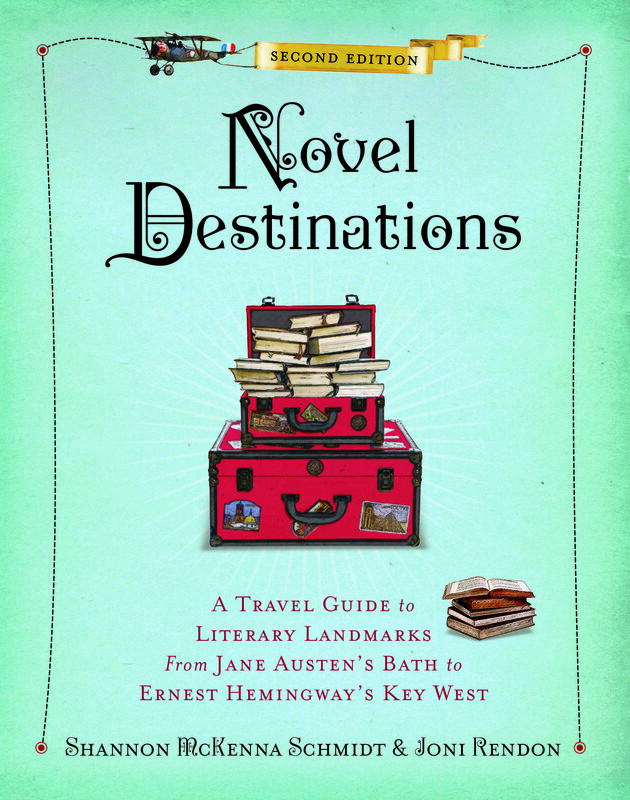 Check out this wonderful blog & book series, Novel Destinations. From Shakespeare to Dickens, from Alcott to Dickenson, this is where our literary heroes found their inspiration. Fantastic photos of the actual locations where your favorite novels were written. Here are ten unusual words from Oxford Dictionaries which are challenging even for the most well-read among you. Its okay to click the link above for their definitions (I did):1) tsunduko 2) colophon 3) libricide 4) bibliotaph 5) princeps 6) bibliognost 7) hamartia 8) librocultarist 9) fascicle 10) scripturient. Art in all its forms creates a culture that Americans need and value. It's not at all optional, it's imperative. Here's a NYT Op-ed on the subject. Are you a compulsive book buyer? Welcome to the club, there are chapters everywhere in the world. Here's an article from the Guardian about "bibliomania." If you're going to be manic, it's a good kind of mania in my book. Happy New Year readers! Hope you find some wonderful tomes to enjoy during the coming year. We also hope that you'll remember to patronize your local indie bookstores in this time of Amazon further invading the corridors of bookselling. Speaking of patronizing your locals, how would you like to get hit by a "browsing fee", imposed on his customers by a British used bookseller. Bah humbug I say. Wherever you choose to acquire your books (and don't forget about the library! ), we wish you a year of fulfilling reading in 2017. You know & love these novels: Pride and Prejudice, To Kill a Mockingbird-- but did you know that those books didn't start out with those titles? Tis the season and Penguin Random House is giving out books! Easy sign up. Does President-elect Donald Trump read? From the Huffington Post: Well, if he wrote it, he definitely reads it. Bob Eckstein (New Yorker cartoonist) is releasing his new book this month, Footnotes from the World's Greatest Bookstores (Clarkson Potter). Doesn't it make you want to be in one right now? Fan of mysteries or author of same? This article in the Chronicle of Higher Education will make you want to run to your nearest independent bookshop. Don't forget the bookmarks! Need a change of pace? Take a Road Trip for Readers and meet the dogs & cats who help sell books in indie bookstores around the country. From "History Buff", here are artistic interpretations of female readers whom nineteenth-century scholars thought that reading fiction was physically dangerous to girls and women of the day. Fortunately, health specialists today find reading to be beneficial to women and men alike, so pick up a good book and stay in the pink! Can't figure out what to get someone as a gift? Buy them an In My Book card and enclose a gift certificate or a check. So much snazzier than a money holder. During the month of March, put "certificate" in the comment section when you buy your cards for FREE SHIPPING. Doesn't Amazon have a big enough slice of the pie? ...and it's a great new year for indie bookstores, according to author and bookstore owner Ann Patchett. Here's her Wall Street Journal article on how customers are returning to main street to shop. The New York Times had an article about how "the internet is increasingly Jeff Bezos world and we're just shopping in it." It's up to us, the shoppers to prevent Amazon from monopolizing the marketplace of books. That doesn't mean you can't shop online however. Have you visited Better World Books or Biblio.com? Got holiday gifts you really didn't want and can't use? 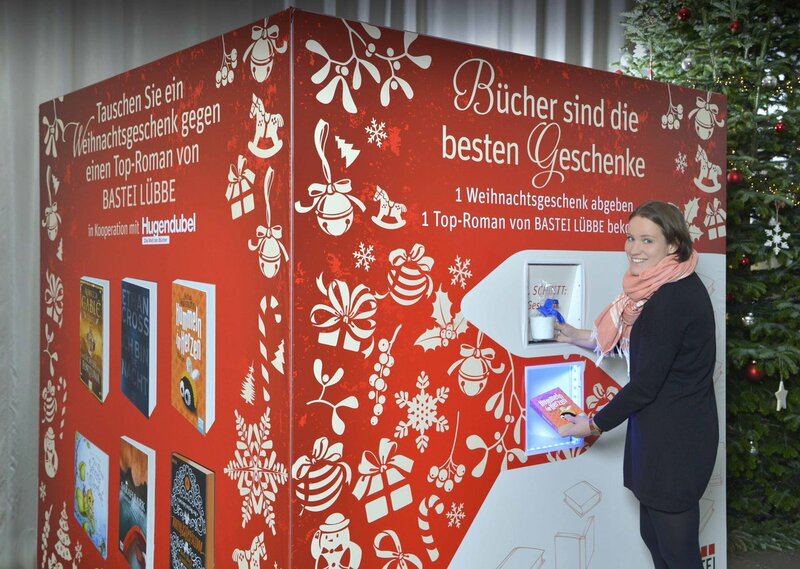 German publisher Bastei Lubbe and booksellers Hugendubel have set up a machine where you can trade your unwanted gifts for a book. Reading beats all other spare time activities in a Nielsen poll. From Barack Obama: "The most important stuff I've learned I think I've learned from novels." From the ultimate source, Publishers Weekly, surveys confirm that millennials prefer paper books to ebooks. With a print book, you can mark your place in so many creative and delightful ways that add to your enjoyment. In addition to our cards, there are plenty of options here: Bookmarks for Booklovers. ...and on the subject of screens and books, here's my favorite book trailer for IT'S A BOOK BY Lane Smith. Watch it here. There's no question about it, screens ARE addictive. From the New York Times Well Column. To the point: thoughts on books and why our attention spans have become so limited. 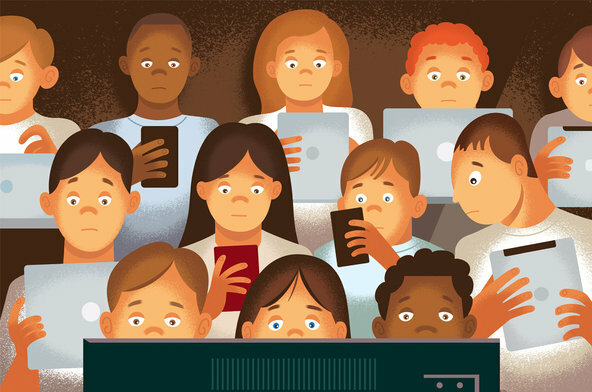 I know I'm guilty of trying to catch a glimpse of what's going on with social media & news sources when reading on my ipad. Let's continue to treasure our printed books and not let them fall prey to the current trend of "planned obsolescence". April 23rd is a symbolic date for world literature. It is on this date in 1616 that Cervantes, Shakespeare and Inca Garcilaso de la Vega all died. Historians believe too that Shakespeare was born on April 23 in 1564. It was a natural choice for UNESCO's General Conference, held in Paris in 1995, to pay a world-wide tribute to books and authors on this date, encouraging everyone, and in particular young people, to discover the pleasure of reading and gain a renewed respect for the irreplaceable contributions of those, who have furthered the social and cultural progress of humanity. In this regard UNESCO created World Book and Copyright Day to take place every April 23rd. Are you a bookmark lover? So many people love and collect bookmarks; there have even been bookmark collectors conventions! We participated in one in 2009 and 2010, but regrettably there haven't been any in the past few years. Here's a wonderful website in Switzerland that helps bookmark collectors stay in touch and do exchanges, Mirage Bookmark. And if you love paper (and fabric and metal and leather and wood and bejeweled) bookmarks, please visit our Pinterest page and follow us. Happy New Year!! Have you met Scotland's LIBRARY CAT? Consider this your introduction. ...and buy them for your friends as Christmas and Hanukah gifts. Tuck an In My Book card into a book or vice-versa, enclose a gift certificate to a brick & mortar bookstore inside one of our cards. Happy Holidays to all! Lots of exciting goings-on in bookstores this time of year; here's a peek behind the scenes in a Barnes & Noble store before it opens for the day. Think outside the box; holiday cards do not have to have snowflakes or holly on them. If your friends are book lovers, they'd probably love one of our cards. "Big brother-ish" news from Adobe about how your ereader sends your reading logs back to Adobe in plain text. (via ars technica). It's like having a little spy in between the covers with you. Welcome to "Thoughts", our "not-quite-a-blog". Stay tuned here for bits and pieces of news and observations on books, authors, reading, publishing, libraries, bookstores and literacy in the 21st century. From time to time, we run contests and give away our cards. It would definitely pay to follow us on facebook and twitter to keep up with news, special offers and contests!